The lilacs are in bloom! It's hit or miss with lilacs in this part of Missouri, especially with the late spring frosts we often get down here in our little valley, which the weather people refer to as a 'low lying area.' Sometimes the bushes put on hardly any flowers (or even none at all), and sometimes they're covered with buds but they end up freezing to death. But sometimes, like this year, everything goes exactly according to plan, the air becomes heavy with that unmistakable thick, sweet scent of hundreds of those tiny flowers in bloom, and for a blissful days I'm in heaven. We did have a pretty good frost Thursday night, but hardly any of the buds had opened yet, and thankfully only the smaller blooms were affected. Warm, sunny days have been teasing out the flowers this weekend, and each time I walk by them I can't help but stop, gently pull down a branch, and breathe them in. Yesterday when I was doing exactly that, Joe said, "Why don't you just snip off that flower and bring it in the house?" And so I did. I put it in a tiny vintage glass and set it on the bedside table next to my favorite stained glass lamp. It quickly perfumed half the room, and last night I was lulled to sleep by its glorious scent. I've decided that old familiar saying should be changed to Take time to stop and smell the lilacs. I'm sure some of you lilac lovers must agree? I didn't grow up with lilacs, so I don't have lots of lilac memories stored away, but I'm busy making up for lost time by celebrating them every chance I can. Breathing in their perfume as I hang laundry in the sunshine. Stopping to take their picture and capturing my hunky farmguy on his tractor in the distance. Lilacs, love, laundry on the line, healthy little lambs. Springtime is lovely. And life is good. In the comments section of this lilac post and this one, many of you were kind enough to share your own lilac memories and stories. I'd love to hear more! Just leave a comment below. 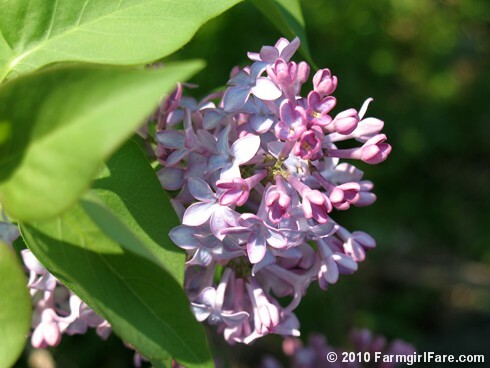 4/5/06: The Lilacs Are Coming! The Lilacs Are Coming! 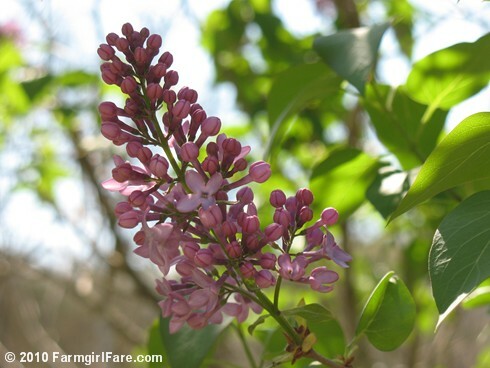 © FarmgirlFare.com, the easy breezy foodie farm blog where I love these windy spring days—except when I'm trying to take pictures of all the lilacs! A new lamb report will be up soon (lots to report! ), but in the meantime, I'm even more behind than usual replying to comments and e-mail. Thanks for your understanding and patience! I love the smell of lilacs and their gaudy profusion of blossoms. When I was in college in Vermont we went to an old inn (redundancy - most things in VT were old when I was in college - early 1970's) and the lane/drive up to the restaurant was lined on both sides with lilac bushes which were much taller than the car - the smell was almost overwhelming but so romantic. I can almost feel like that 20something girl again when I smell lilacs in the evening breezes. I love the scent of lilacs! I wish we had a few on our farm. 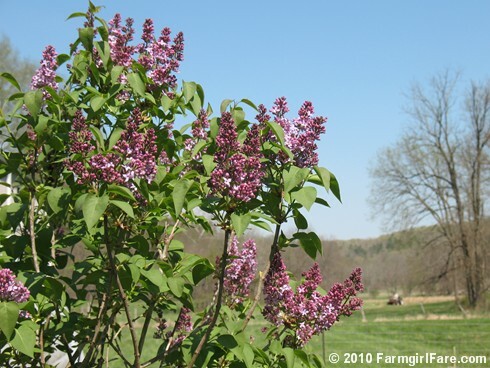 I DID grow up with lilac trees - not bushes - they were literal trees. And our favorite thing to do was catch someone under them after it rained and shake the branches and "rain" on them! I have no idea how we thought of this, but I remember it as fondly as any of my childhood memories. I can remember is SO CAL paying $60 for a bunch of Lilacs. Foolhardy, but OH! that fragrance. Now we live in SW WA where Lilacs are everywhere; practically a foundation of life. I'm not sure they smell any better but certainly cost a lot less. And I love your Lambs and pictures. We can't grow lilacs in Florida, unfortunately. I do miss them. We have the same weather here in NE Oklahoma that you have there in Missouri. I planted lilacs three years ago and this is the first time Mother Nature has allowed them to bloom. 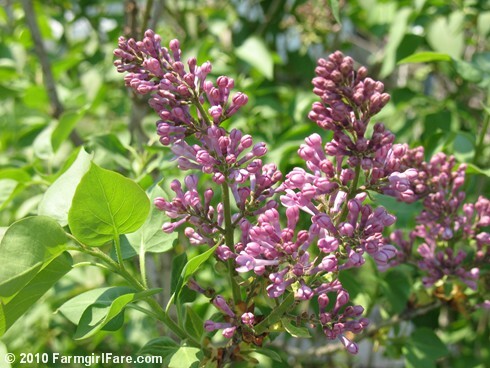 When I was a little girl we had a huge lilac in our backyard along the fence with a railroad tie border in front of it. It arched over so you couldn't stand but a little girl could sit on the tie with the lilac curling over and around her - like a little lilac cave. I love that memory. I planted a lilac in my garden a few years ago but it's still too small to blossom - I keep hoping, though. It's doing quite well this year, so maybe (but not likely). 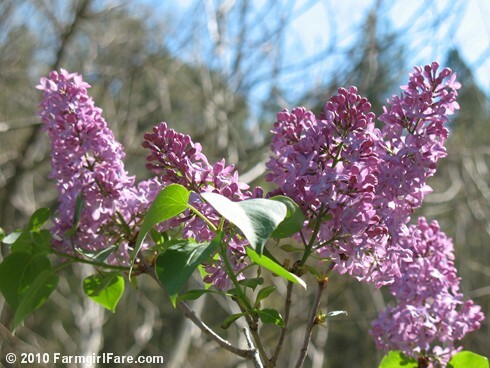 Lilacs are my favorite of spring flowers and I can hardly wait until ours are in bloom. They fill the house with a great fragrance in a boquet! So lovely. I don't have any lilacs any more in my yard, and I really miss them! I'm so envious of your blooms! We recently moved to south Texas, where I learned it's not possible for lilacs to grow b/c the weather doesn't get cold enough during 'winter.' 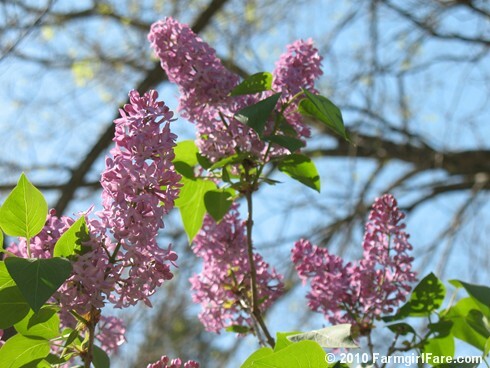 I miss my lilacs in Wisconsin! I'll live vicariously through yours. I live in Central California and was just listening to some ladies from a new subdivision nearby talk about how lilacs won't grow in our area because it isn't cold enough. I'm the 5th generation of my family to live in my house. I have lilacs in my yard that are older than I am and they bloom every year. They are a lavender and a white vulgaris, but I've planted French hybrids that are also doing quite well. I mulch them with wood ashes, but they don't require much work. Even if you only got blooms once every 3 years, it would be worth it. I love lilacs too. We had a gorgeous one at our last house and it was really hard to leave it behind. I just bought one for our new garden last week though, can't wait! So envious! We have a purple lilac bush in our back yard, and a white lilac tree in our front yard. Since we're in MN, they are just starting to leaf out. I can't wait until they start to bloom and I can have fresh lilac branches in the house! For a short period of time, my mother owned a house in Twin Falls Idaho with a huge lilac hedge in the back yard, covering two sides of a fence. Underneath and behind, at the corner where the fence met, was the best hidey hole ever, and I can remember playing house with my barbies in there (it was all about creating the house, not about the cloths for me - tom girl for sure) while the lilac hedge was in full bloom. Since then, I have always used "is this lilac country" as a bench mark for where to live. I had them at my wedding. The are still some of my very favorites some 35+ years later. I am a loon with lilacs. My neighbors tend to bring me a bunch every year (they have a very happy bush in their yard) and I carry that bouquet around the house with me in its old jar until the flowers go bad. I don't even care that I seem like a psycho with my jar of flowers, I'm very happy. And, really, there's nothing like going to sleep with the smell of lilacs in the air, is there? "Take time to stop and smell the lilacs. I'm sure some of you lilac lovers must agree?" Indeed. Having none of my own yet, I stop and pull down branches on bushes near the sidewalk in other people's yards. Three good lungs-full, and I'm good. But I won't get to do that until JUNE. The buds on trees here have just started to swell. We still have 2 or 3 dumps of snow to go. At least the robins are back. Thank you for the lovely lilac pictures. My parents had eight lilac bushes in our backyard running in a nice straight row. We'd always have so many blossoms. I can remember loving their scent. When I was a teenager I would cut them and put them in my room. I'd have my bedroom window open with the cool spring breeze coming in and that wonderful lilac scent in the air. I love that memory. 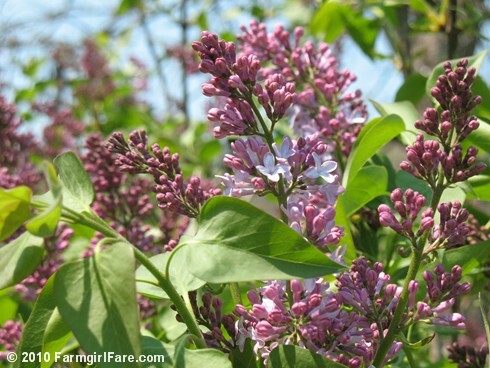 I believe I am going out to buy a lilac bush this week! I don't have lilacs at my place but I am lucky to have a huge lavender wisteria covering the fence by my veggie garden. It's coming into full bloom right now and smells delicious. 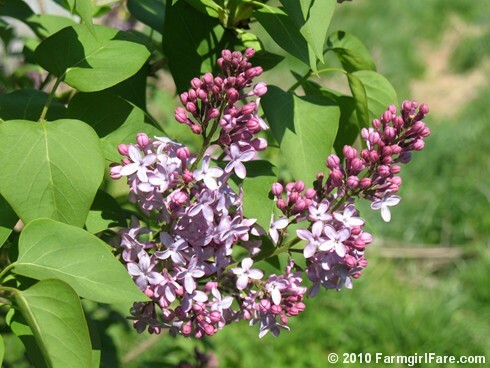 Reading all these posts makes me think I'll look for some lilac plants at the nursery on my next run though. I would think they'd grow in central California - heck, everything else does! I have had an ongoing love affair with Lilacs my entire life. I grew up in a Victorian house in SE Iowa. There were two gigantic English Lilac bushes just below my second story bedroom window. When they were in full bloom; I would open my window and my whole room would be saturated with their intoxicating aroma. My mother would cut abundant bouquets and take them to elderly ladies in the church, and she also filled the front of the church with the lovely blooms. I don't currently have Lilacs of my own, but when I am given a bouquet, I can't breathe in enough of their amazing scent! i just cut lilacs, and oh my, that scent. i have one vase in the kitchen and another in my bedroom. i am lucky. the lilac bush i picked these from was my great-grandmother's. another plus of living on a family home. Your pictures are so fabulous...I can actually SMELL the lilacs...bliss! The winter was very hard on my garden this year and I am not sure whether my newly planted bushes made it...thanks for sharing yours!